Plymouth Harbor is still without its main attraction, a replica of the Mayflower. But by the time the community celebrates the 400th anniversary of the Pilgrims’ landing, the harbor may hold two of the ships. A group in Harwich, a small seaside town on England’s east coast, is building its own replica of the Mayflower, and plans to sail it to America in 2020 to help the community reclaim its piece of history. Plymouth, England, is widely regarded as the Pilgrims’ port of departure, but Harwich is where the original Mayflower was built and, some argue, is the true starting point of the journey that ended in Massachusetts in 1620. The Mayflower originally set sail from Harwich, but made an unscheduled stop farther down the English coast, in Plymouth, when its companion ship had leakage troubles. “Harwich is her natural home port, which is the missing part of history,” said Jeff Webber, training and development manager at the Harwich Mayflower Project, the group spearheading the building of the new replica. In Massachusetts, local tourism officials say the more the merrier when it comes to the Mayflower and the 400th anniversary of its voyage. Richard Pickering, deputy director of Plimoth Plantation, the living-history museum that owns and operates the Mayflower II, a 56-year-old replica, said a second ship can only be a benefit. 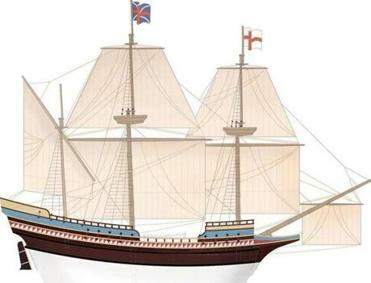 The new Mayflower replica, which has yet to be named, will cost between $3.9 million and $4.6 million to build, according to the Harwich Mayflower Project. Builders have already begun shaping the ship’s lower keel, and when it is finished, the vessel will weigh roughly 200 tons, Webber said. The group expects to complete the Mayflower replica in the next three to four years, and sail it before its 2020 commemorative voyage across the Atlantic. The Harwich Mayflower Project intends the ship to sail regularly between the United States and the United Kingdom, spending several months in both places. The Mayflower II sailed from Plymouth, England, to Plymouth, Mass., in 1957, to commemorate the cooperation between the two countries during World War II, and became a major tourist attraction. The ship, undergoing a multiyear restoration in preparation for the 400th anniversary, has been in dry dock in Fairhaven since mid-December after an inspection showed rotting in the hull. The white oak needed to make the repairs is difficult to find in just the right size and shape, and that has delayed the ship’s return to Plymouth Harbor. Shipwrights expect the Mayflower II to be back soon, said Peter Arenstam, manager of the maritime artisans department at Plimoth Plantation. He said the last planks were being put on the ship’s port side Monday, and workers will soon start on the starboard. After that will come caulking and painting. The Mayflower II’s absence from Plymouth’s waterfront has hurt businesses like the John Alden Gift Shop on Water Street, where owners Laurie and Jon Gibbs say foot traffic has been down without the ship to draw people. The couple run three other shops that also sit across from the Mayflower II’s berth. Upon hearing that another Mayflower replica was in the works, Laurie Gibbs, a descendant of Pilgrim Richard Warren, had only one question.